“Nadine” (Hailee Steinfeld) is “all of us,” as the cool kids are saying these days. She’s an insecure 17-year-old who has already experienced real loss, struggles making friends and feels as though she’s perpetually in the shadow of her popular, confident older brother “Darian” (Blake Jenner). When he starts dating her only real friend, she feels even more like an awkward, unlovable failure who might never fit in. The story begins as a classic loner tale - an outcast who feels lost and abandoned, trying to cope with her insecurities. So far so good. As the two hours move along, however, Nadine becomes less and less easy to empathize with - she ignores her budding friendship with a cute classmate, fawns over a guy who has no interest and essentially acts as though no one’s life matters but her own. The character’s bitterness and lack of perspective despite the struggles she has been through feel false and contradictory, no matter how great the other characters or the film's message may be. What starts out as a funny, relatable glimpse into Nadine’s world turns into a seemingly-endless string of her angrily riding her bike or aimlessly sitting outside of convenience stores and yogurt shops. The compelling main plot points of losing her father, brother and friend seemingly all at once are essentially dropped and feel unfinished. She confides in “Mr. Bruner” (the always-hilarious Woody Harrelson), a rough-around-the edges history teacher who never lets Nadine take the easy way out. Their scenes together are the highlight of the film, and feel as though they belong in a different, more cohesive high school narrative. Craig’s script is admirable in the sense that Nadine’s problems don’t feel like the ones typically depicted in movies - her one true champion died, and she feels like no one can understand what it’s like to be her. She cares about much more than parties, social media and having a boyfriend, which is refreshing for a young female character. I felt as though she took the words straight out of one of my senior-year journals when she tells Mr. Bruner that she has nothing in common with her generation, and even though she would never in a million years want to be like them, it’s incredibly difficult to be different sometimes. This is the Nadine I wanted to see more of - less anger, more honesty. The theme of The Edge of Seventeen harkens back to another more popcorn-y teen movie, the 1998 filmCan’t Hardly Wait, in which Jenna Elfman’s character says sadly, “we all have our things.” Everyone - teenager or not - has problems that make them feel like they aren’t good enough, normal enough, skinny enough, pretty enough, social enough or funny enough. To quote Nadine’s mother (a funny, frantic Kyra Sedgwick), some of us are just “better at hiding it.” Despite its humorous and heartwarming moments, Craig’s feature is a little too good at hiding what makes it great. Nadine and her story have charm and important themes about confidence and learning what really matters, but they're buried underneath a somewhat-scatterbrained plot. Top Photo: Nadine pondering life outside a mini-mart. Middle Photo: Steinfeld's character feels like she'll never have enough confidence. Bottom Photo: Nadine and Mr. Bruner make up the film's best moments. 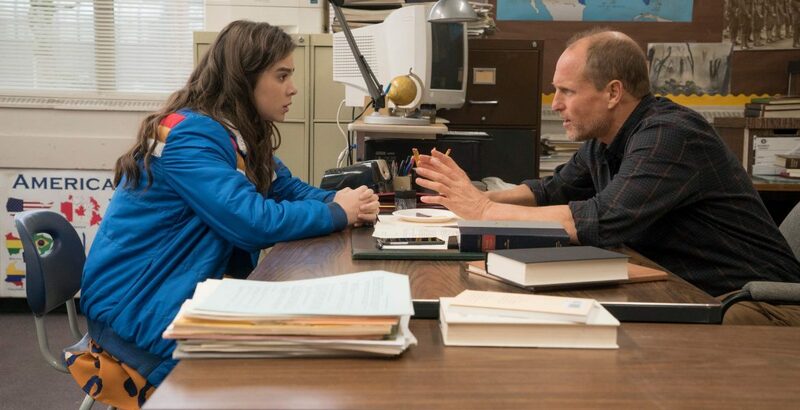 Q: Does The Edge of Seventeen pass the Bechdel-Wallace test?